Scallops are everywhere right now and I love this sweet style. 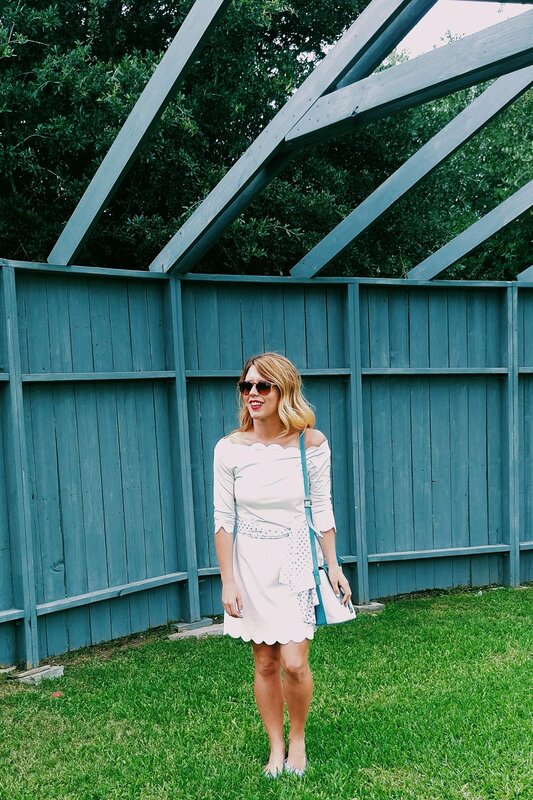 I picked up a few dresses earlier this season (see this post and this post on the Daily Dose feed). I also have a pair of scalloped ballet flats that I've worn on the blog numerous times (see here, here and here). I also really love this bag with scallop trim. 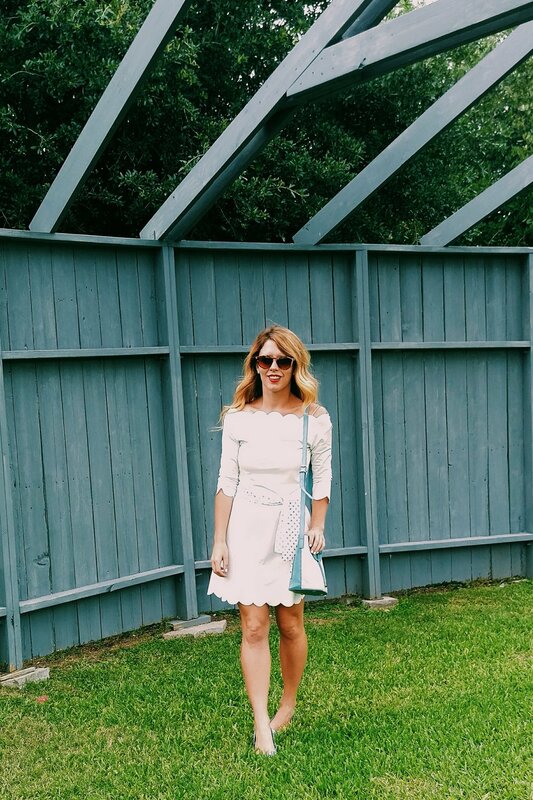 I decided today to wear this white dress with a baby blue two toned print bag. 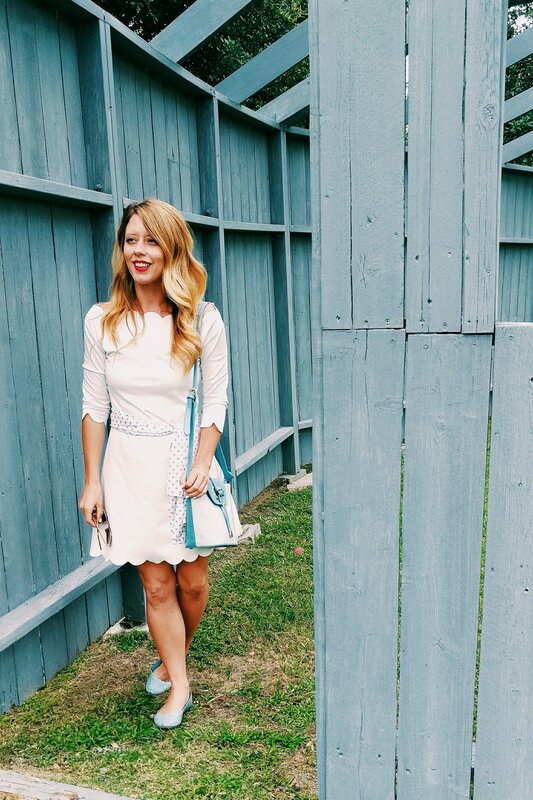 Light blue is one of the staple colors in my closet. It pairs really nicely with white, blush or yellow. I tend to stay on the pastel side of things or wear really bright colors like red or a daffodil yellow. If you are looking to establish a color palette in your closet, check out this Style Studio post for a few tips and tricks. As far as neutrals are concerned, white is one of my favorites! I also like camel, navy and occasionally sprinkle black into the mix. Although whenever I wear black, I like to add a little color. When you have a go - to color palette is allows your wardrobe to mix and match easily. You almost don't have to even think about if something will go together. Oftentimes, I don't plan outfits out in advance (unless I'm traveling). My closet is already curated for things I love and tend to stick with white, yellow, blush, blues, hot pink and a few other neutrals.